Adding decimals is just same like adding as usual. How to add decimal number? 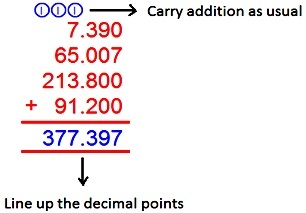 ● Write down the decimal numbers, one number under the other number and line up the decimal points. ● Arrange the addends in such a way that the digits of the same place are in the same column. ● Add the numbers from right as we carry addition usually. 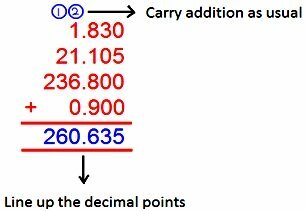 Read the above explanation step-by-step and try to understand the examples on addition of decimals. 2. Terry spent $33 and 65 cents on Monday, $21 on Tuesday and $9 and 7 cents on Wednesday. Find the total money spent by her in three days altogether. 3. First number is 85.99, second number is 107.81 and the third number is 19.207. Find the sum of the three numbers.